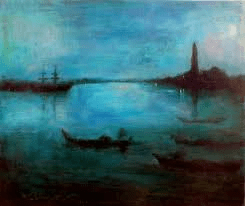 James Abbott Mcneill Whistler, (1834-1903), Nocturne Blue and Silver: The Lagoon, Venice. Absolutely love these paintings by James Abbott Mcneill Whistler, an American Post Impressionist painter, who lived and painted in England for a while, and painted landscapes, amongst them he made a series concentrating on the docks, in Battersea London. Whistler had an interest in using pre-determined limited palettes, which is interestingly, what I am exploring. Both these examples of his works demonstrate a limited palette, showing a very effective and dramatic feel to his work. He was a beautiful free spirit and radical, his Mother wanted him to become a Minister, but that didn’t work out, then Military school, that did not go down well either, as he got thrown out of Military school for drawing in class! Right on James Abbott Mcneill Whistler, we salute you for your Creative mastery.